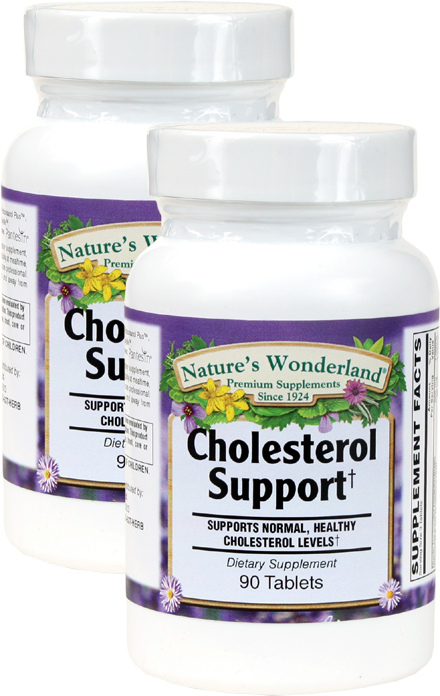 Cholesterol Support, 90 Tablets Each (Nature's Wonderland) - Penn Herb Co. Ltd. Nature's Wonderland Cholesterol Support promotes normal, healthy cholesterol levels with mega potency Policosanol, Plant Sterols, and herbal extracts. Oat Bran...well-known source of soluble fiber helps to maintain serum lipid levels already within the healthy range. Garlic...5,000 year-old spice promotes cardiovascular and cholesterol wellness. Plant Sterols...plant compounds promote healthy cholesterol and triglyceride levels. Supports healthy cholesterol metabolism; supports healthy HDL cholesterol levels already within the normal range. As a dietary supplement, adults take 3 tablets daily at mealtime, or as directed by a health care professional.